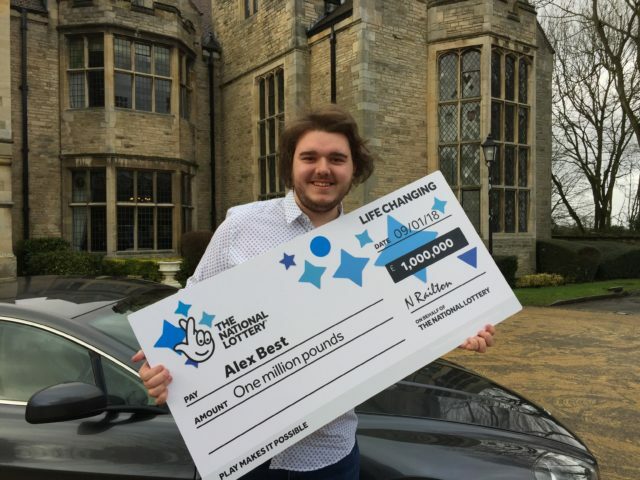 A music lover who graduated four months ago has paid off his student debts and can pursue his dream of working with touring rock bands after he won £1 million on the EuroMillions. Alex Best, from Shildon, County Durham, will now consider buying an Aston Martin despite not having passed his driving test yet. But the 21-year-old was keeping his feet on the ground by travelling second class on a train journey to Surrey for a job interview on Thursday. Mr Best, who graduated from Bolton University after taking a degree in live event production, has already worked at concerts for the likes of Sir Elton John, Bruce Springstein and Madonna. He hopes to get a job in live music events and has been working part-time as a nightclub barman. His ambition is to work for big tours and festivals like Glastonbury. He said: "It's an unbelievable feeling knowing that I'm now debt-free. "Every student has money worries, working from pay cheque to pay cheque, so it's just amazing to know I never have to worry again." When he passes his driving test, he will think about getting a sports car and said: "I have had my eyes on a few cars - I could even buy an Aston Martin - but I'll wait until I pass my test. "How many graduates can say their first car was an Aston Martin?" Mr Best almost collapsed in Sainsbury's when he found out he had become an instant millionaire in the draw which was held on January 9. He matched no numbers in the lottery draw but his ticket was a raffle winner.